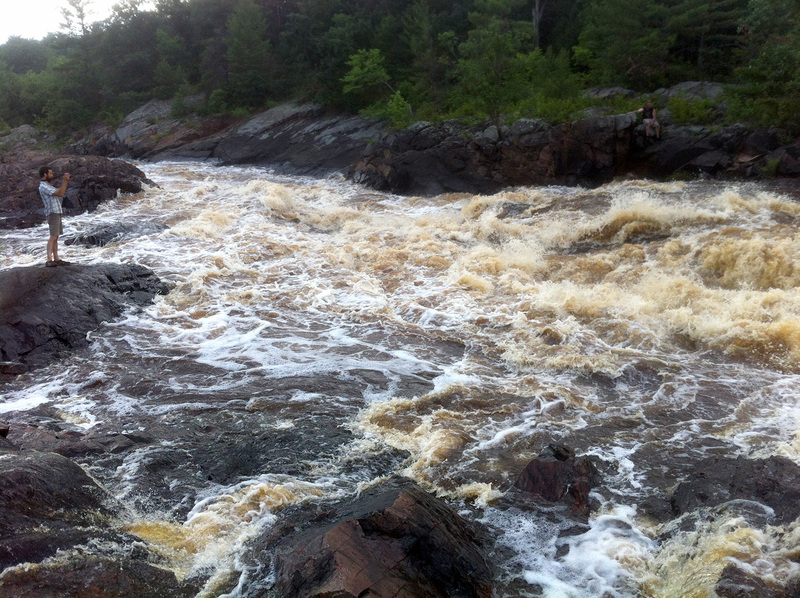 Halls Creek is one of many excellent paddling destinations in the Black River Falls area. With countless riffles, a few Class I ledges and numerous stunning rock formations that decorate the twists and turns through an often intimate and sometimes canyon-like setting, Halls is a bucket-list paddle. Gauge note: This gauge doesn’t directly correlate to the creek. 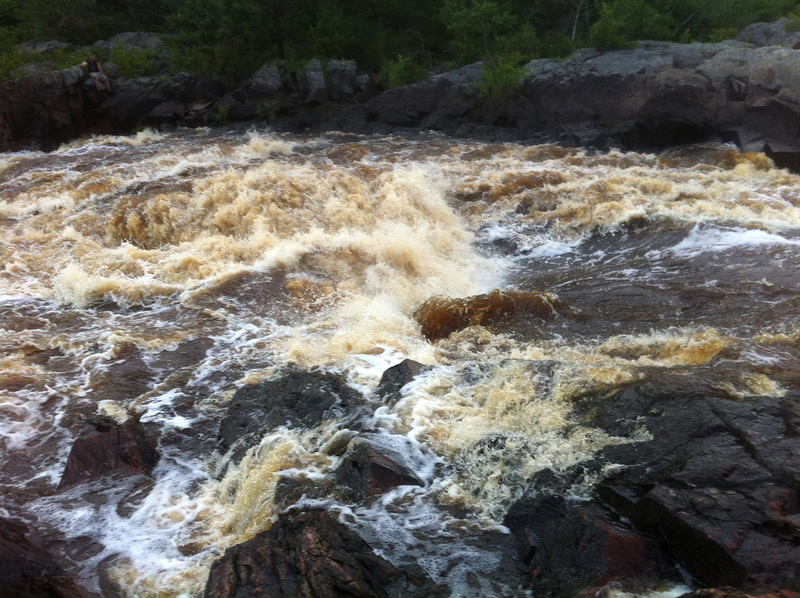 It does, however, give a good idea if there has been recent water in the Black River Falls area. Use the visual gauge, as the correlative gauge is misleading. 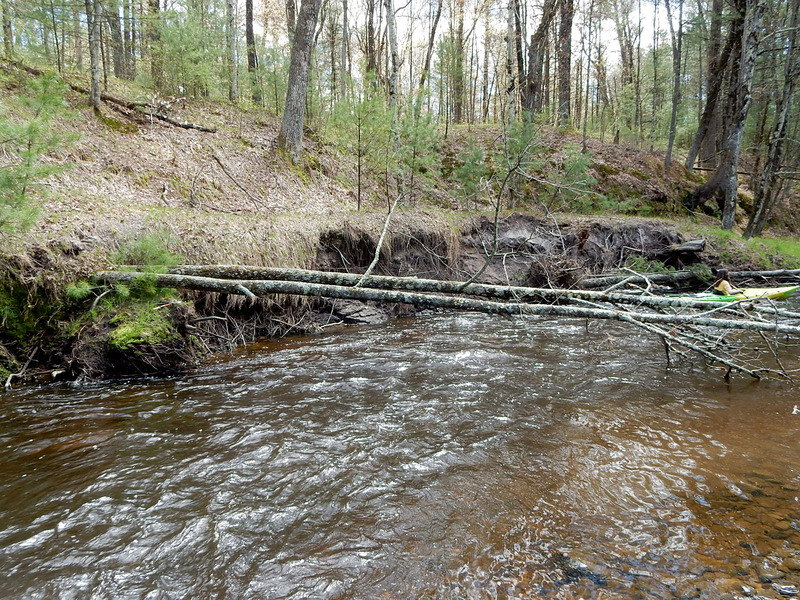 We’ve paddled this when the Neillsville gauge on the Black River was an astonishing 2160 cfs and then again at a lower 200 cfs, and while there was a distinct difference, it certainly did not correlate to 11 times less water the second time around. 200 was very low – probably too low in fact. But it’s reasonable that if the gauge is at least 400 cfs you can be confident that Halls is running as well. Based on this trip, the cfs had no correlation to the water level. 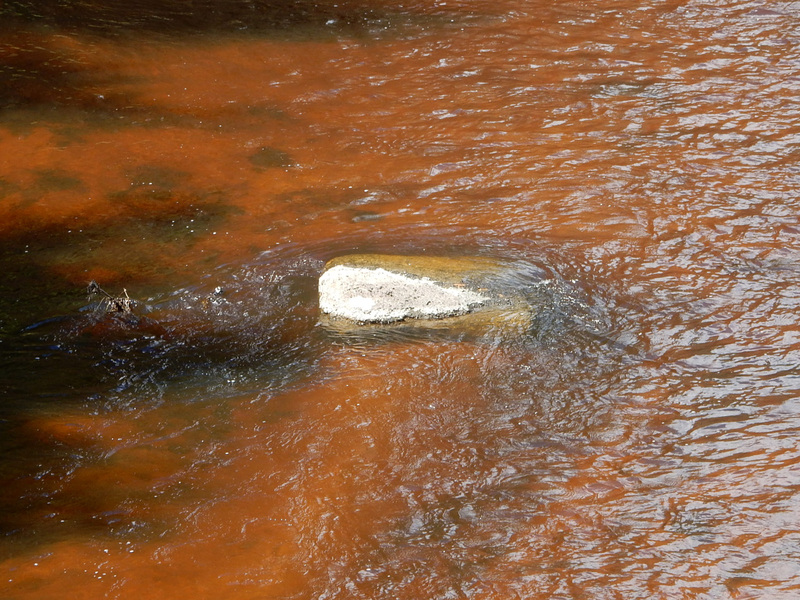 The key for Halls is the visual gauge on County Road E looking on the upstream side at a rock in the middle of the stream. If just the tip appears, there’s plenty of water. If half the rock is exposed, it’s too low. Time: Put in at 1:00p. Out at 6:05p. We’ve covered Halls Creek twice before but this was my first time at very low levels. And you know what? It makes all the difference. Not that it was bad – nor did we have to walk – but the current and riffles are noticeably slack or even non-existent with even an inch or two less beneath our boats. A low-level Halls is still a great run but temper your expectations and also know that it can be an even more exhiliarating run at higher levels. Now, if a birthday wish is wished, a birthday wish gets granted for Miles Paddlers. In this case, Timothy was about to climb over a significant hill, and if one is going to notch another decade on their belt, what better way is there to celebrate such an occasion than by hitting the best of what the Black River Falls are has to offer? That being the trifecta of excellent creeks; Morrison, Halls and Robinson – quite argueably, three of the best in all of Wisconsin. These three creeks are all different paddles with regards to character – but all of them awesome. It was kind of like we all got a birthday wish granted. Much like our revisit to Morrison Creek report from a day earlier, we won’t recount every step of the trip since we’ve reviewed it in detail a couple times (in 2014 and a shorter trip here in 2015) and as far as what to expect, they’re both still accurate. There were no portages to contend with this visit, save for a couple newly-fallen trees. 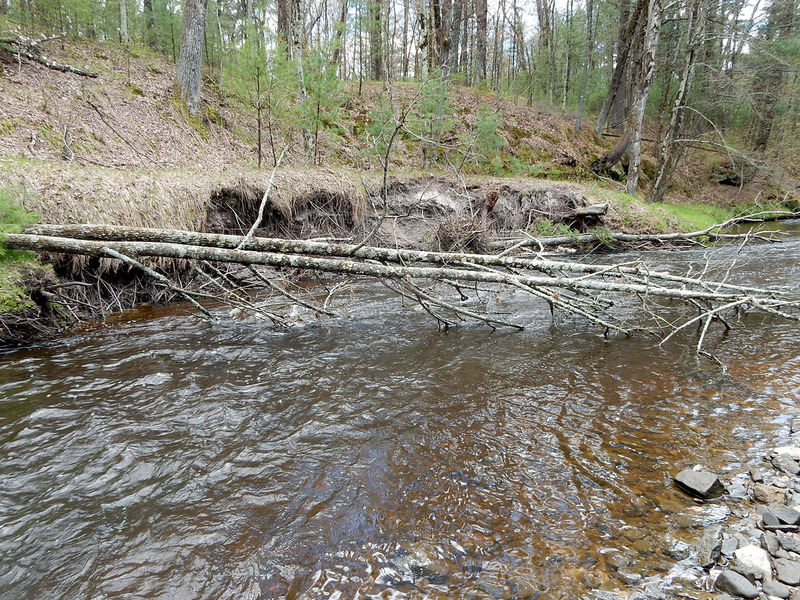 One we trimmed, (before and after) and the other (a casualty of erosion) can paddled around. I would suggest that those who have never paddled Halls should paddle the entire section from Trow Lake Dam to Halls Landing – especially if the water is up. Trow Lake to Garage Road is mostly lightwater – as Timothy has recently coined – with nothing too technical. The Garage Road to Halls Landing segment is just a little more exciting in terms of riffles and waves and probably even more majestic outcrops. This section is where the three larger ledges reside and they should be scouted to find the right line. Put both of these sections together and it make for one helluva excellent day paddle. The put-in below the dam is decent, though there is a rugged trail to descend down to the landing area. From there, a narrow and canopied creek awaits with gentle riffles ready to carry you onto bigger and more beautiful scenery. It’s quite inviting. What you’re treated to is a simply engaging environment on a creek that is never very wide. You’ll float atop copper-hued water, over sand and stone, while discovering countless rock formations and outcrops that form small canyon-like bends and halls. There are numerous seeps and a few side streams (one in particular is a treat to explore). Often tree-lined, with sandbars that part the turns, it’s a photogenic feast throughout. It’s almost the perfect creek if there was such a thing, in my opinion. In fact, we had some discussion about what was better – Morrison, Halls or Robinson? (which we revisited the following day) I’ve often said Halls Creek is my favorite but it’s kind of a pointless discussion as they are all different by more than a couple degrees – each with unique characteristics. And of course, water levels play into the kind of experience you’ll encounter on any given day. The best part of the argument is that you really have to paddle them all to have even have the argument, so in the end, you win by just paddling them. And even then, when you can make your case for favorite, it’s like choosing your favorite child. Impossible. After the Garage Road bridge, there are three ledges but there is space between them – they are not consecutively on top of one another. One is a former dam that has an easy chute on the far-left. The second is more of a drop which should be scouted on the right, as should the third. Though the third isn’t challenging, it’s often scrap-ey in low levels and you’ll want to find the path of list resistance (which was the middle on this day). Just after County Road E and just before the confluence and take-out on the Black River is an impressive seep/waterfall flowing down from high above and over a pile of tumbled rocks (the birthday boy, of course, climbed his way up to get a closer look). It’s one last wink from Halls before the end of a special trip. But for us, it didn’t stop there, we witnessed something extra special. While paddling into the Black River, I was leading the way. I glanced upriver and noticed some tan spots in the distance mid-river. Not thinking much of it, I turned my gaze downriver thinking they were logs or something until I heard “Elk!”. I spun my head around and sure enough, they weren’t logs – it was a herd of 6-8 Elk crossing the Black River in a single file line. The leader of the pack tried to lunge up the muddy bank but slipped back down into the water which gave us some extra time to stare and appreciate the sheer size of them. We were a distance from them but they still appeared huge, leaving it to our imaginations as to how we’d size up if we were standing next to one. The first one eventually made its way, as did the others, and they carried on into the woods. There was a fisherman on the opposite side of the Halls Creek bank who witnessed it too. He said he’s been fishing there for 10 years and had never seen elk there. It was pretty amazing and though most of us snapped shots on our phones, we were just too far. Luckily, Timothy (who coincidentally was pulling up the rear) caught the backend of one. Fitting, right? After I posted the shot on Facebook, there was a comment that they were recently introduced to Jackson County and sure enough, that would explain it. After the excitement, we all took-out at Halls Landing on the Black. The landing is paved, making for a very easy and accessible exit. Every inch of this water. Halls Creek is as good as it gets for creeking in Wisconsin. The unexplainable aspect to this trip was the water levels. The area had plenty of rain recently. The usual suspects that are historically water dependent were up and paddable, (Morrison was rocking, Robinson was frisky and a few of us paddled the East Fork – and if the East Fork rapids are runnable, you know the water is up) so we figured Halls would be too. But it wasn’t. Everything was up except Halls. 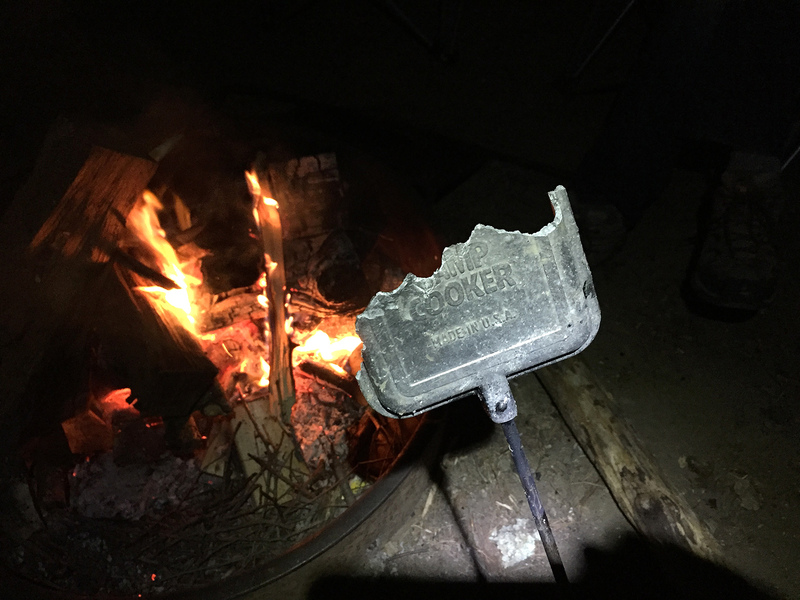 It was almost the same on the visual gauge as our Halls Creek II report – so it definitely didn’t equate to the fun we had on our first trip in higher levels. Our educated-hunch is that the dam affects Halls more than we thought and that the correlated gauges mean very little (but at least we have the visual gauge to go on). So Halls took us by surprise and the only thing we can figure is that the dam had everything to do with the levels. Though Halls is so damn beautiful, it hardly matters what the levels are. For first timers, it’s still glorious – even in low-water. For repeat visitors, with some perspective on how it runs in higher levels, this trip (while still beautiful) leaves you longing for more because you know how much more fun it can be. Either way, Halls Creek is a special paddle, and one to return to again and again. Immediately pretty and engaging after putting-in. Mild riffles on the upper section of Halls. Beautiful boulders and rocks create the banks. A little side channel worth exploring. Just one of many gorgeous secrets along Halls Creek. A tree that had no hope of seeing its next decade. Approaching the chute at the removed dam. Damn fun dam chute to run. At times you feel dwarfed by the majesty of the environment. The second of the larger drops (the dam being the first). The third of the larger drops. This third ledge should be run in the middle at these levels. A man and his seep. Or more like a waterfall, really. Halls Landing take-out on the Black River. Halls is a creek for creek lovers and it’s exactly the kind of destination that keeps us searching for the next great paddle. It’s exciting but not overly-complicated. With near constant riffles and Class Is, a few exhilarating (but manageable) drops, natural springs that trickle down the banks into beautifully cut sandbars and pools and endless, sometimes jaw-dropping, rock formations in a canyon-like setting, it has everything you’d ever want but are unlikely to expect from a creek. It’s a thing of beauty. Time: Put in at 12:25p. Out at 4:05p. Wildlife: A blue-winged teal, an osprey, two deer and a bald eagle. 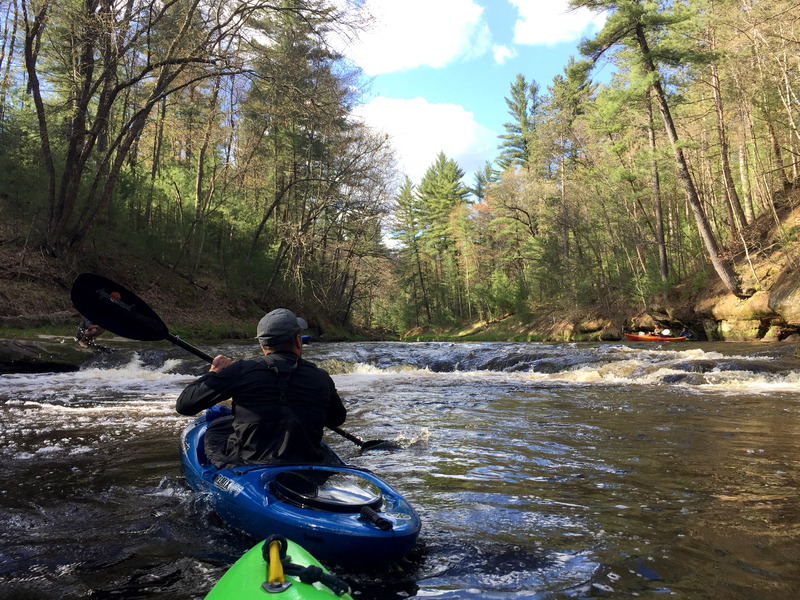 Ever since paddling Robinson Creek back in 2012, the next must-paddle destination in the Black River Falls area was Halls Creek. Spotted on a map given to me by the Park Ranger at the Black River Falls East Fork Campground, (and subsequently destroyed in that night’s rains) I knew there was more to these feeder creeks that needed exploration. Halls, like Robinson, typically has very little water this late in the season to paddle. Part luck, part global warming, here we were in late June with enough water to give it a run. Now, in reality, the gauge has arguable correlation to the creek, as Halls is controlled by a dam and it is the Neilsville gauge (on the Black, much further upriver) but for our own benchmark and the recommendations via American Whitewater, it’s what we have to go on for comparison’s sake. If anything, it’ll give you an idea if there’s been recent water in the area. We, of course, were going regardless of levels (because we’re stubborn like that) but damn did we get lucky with that late-water arrival because the levels were perfect and I can’t imagine (nor recommend) paddling this at lower levels. We rarely scraped but it could be a potential walker at lower levels. So me and fellow-Miles Paddler, Timothy, set out to feast on the beauty that is Halls. This is a beauty of a creek. There probably aren’t enough superlatives to describe how fun and naturally breathtaking it really is. It’s the pinnacle of creek paddling for me, personally. This creek doesn’t quit and you’ll be rubber-necking the entire way as you make your way past canyon walls, through seemingly non-stop riffles or splashy Class Is. You’ll pass numerous natural springs that create little photographic nooks and inlets and the occasional small waterfall. Capped off by three exciting drops between Garage Road and the take-out, this is like a movie you’ll want to rewatch as soon as you’re finished. We met a friendly local at the put-in who told us we were going to love it. He was about to take a friend down Halls but was taking-out at Garage Road because his buddy was new to kayaking. He told us that below Garage, the paddling is a bit more technical. After running it, I’m not convinced it was anymore technical than the first four miles but one man’s technical is another man’s median (and at this point, we’re probably just splitting hairs). However, the three drops that reside on the downstream side of Garage are indeed, drops, so he was probably (and correctly) erring on the side of caution. Fun fact about this guy. He’s got his own unique bike shuttling setup. A van with enough room for his kayaks and a moped (this being the first moped shuttler I’ve met). The section to Garage road is indeed great for beginners but it would be hard to recommend this creek without recommending the whole stretch. It’s just too damn beautiful and since the drops are easy to run, they are similarly easy to portage if you wanted to opt out. Plus, it only took us an hour to paddle to Garage Road in these water levels. Much too short of a trip if you’re making the drive to the Black River Falls Area. The put-in at Trow Lake Dam isn’t the easiest for the casual paddler. It’s a bit of a downhill hike through some tall weeds and grass and it involves a bit of climbing over a tree. Once you’re on the water, you’re immediately greeted by riffles and swift currents and you might not know it yet but you’re in for something special because it just doesn’t quit. It’s corner after corner of something new to look at or currents to negotiate. 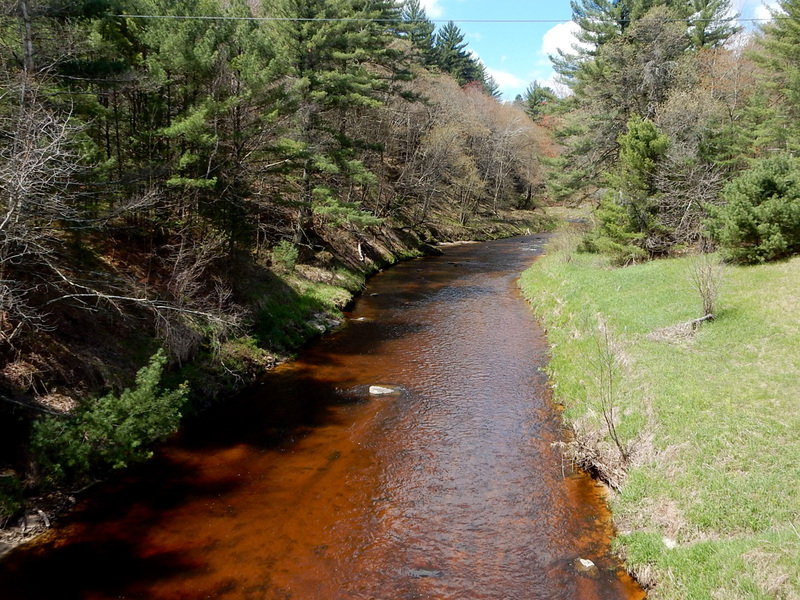 The water changes from clear and clean to brown muddy root beer (most likely due to all the recent rain) which is common to the creeks in this area and very different than the black of, well, the Black river. I was surprised by the width of the creek. It’s much wider than I expected, having Robinson Creek on my mind as the only other paddle in the area to compare it to. It’s not like Robinson at all – in fact, it’s completely different. Robinson is more intimate with less of the majestic rock formations. Halls is much wider and just a bit more breathtaking with every turn. And it’s not Carroll Creek even though I wanted to compare the two because it shares so many similarities with its rock formations and constant riffles. For my money, this holds an edge on both the Robinson and Carroll but shares similarities to both. It’s just a helluva lot of fun. Prior to Garage Road, there was one tree to portage. Well, it appeared to be a portage at least. Turns out, it can be limboed under river-right, something I didn’t think was possible until I was standing on the log and watched Timothy float under unscathed. Past Garage Road, where again, it gets arguably more technical, there are three distinct drops to contend with but all three can be portaged. The first, is an old dam. On river-left is a concrete slab that makes a very convenient slide – a little chutes and ladders if you will – with a bump in the middle. It’s pretty easy but it can also be portaged river-right with some creative climbing and scooting. The next two are before the County Road E bridge and they are nearly consecutive. The first is a play spot with a few different lines to choose (in fact, Timothy ran it twice for varieties sake). I chose the pool which was a blast. This is easy to scout and portage if need be. 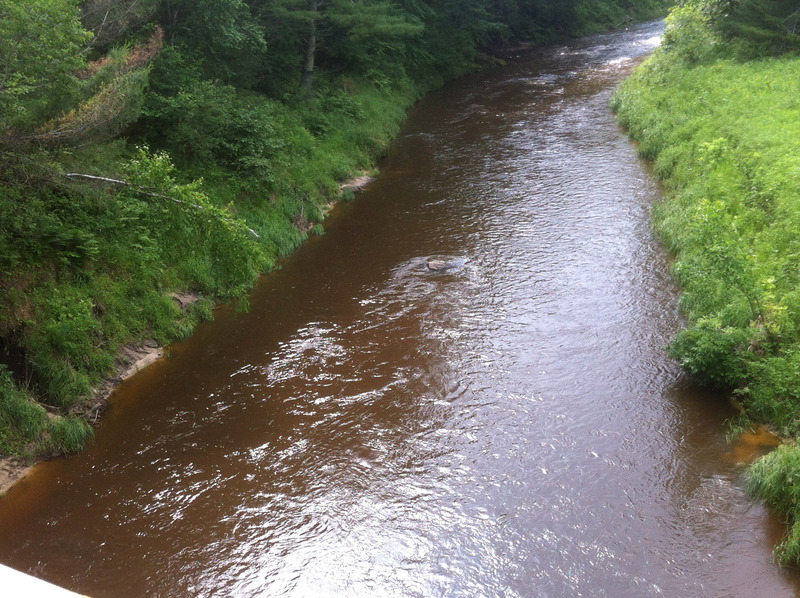 The final drop is a few hundred yards downstream from the second and it’s more or less a gradual slope. I likened it to a shallow gravel driveway incline because I was scraping and scratching my way down. We both ran it river-right where it’s also easy to portage. That’s where we thought all the excitement would end but again, this creek doesn’t quit and Halls continues to surprise. Figuring we were nearing the confluence with the Black where the current would slow down, we were both caught off guard by a boulder garden lying just beneath the surface on our approach to County Road E. Neither of us lost it but it was touch and go there for a bit. It was a good reminder to not get too complacent and keep seated until the ride is over folks. In hindsight, we probably should’ve expected the boulder garden since this is where the visual gauge is located looking down from the bridge. Finally, past County E and closer to the confluence, you’re greeted with one last wink from Halls. The largest natural spring waterfall on the trip greets you on river-right, just tumbling down from the high cliff onto some large slabs of rock. Halls made us feel like we were welcome company with this last send off. It was an unexpected and pleasant surprise capping off an exciting trip. Just a few more paddle strokes and you’ll spot the Black, in all its true blackness and noticeable contrast to the brown of Halls. 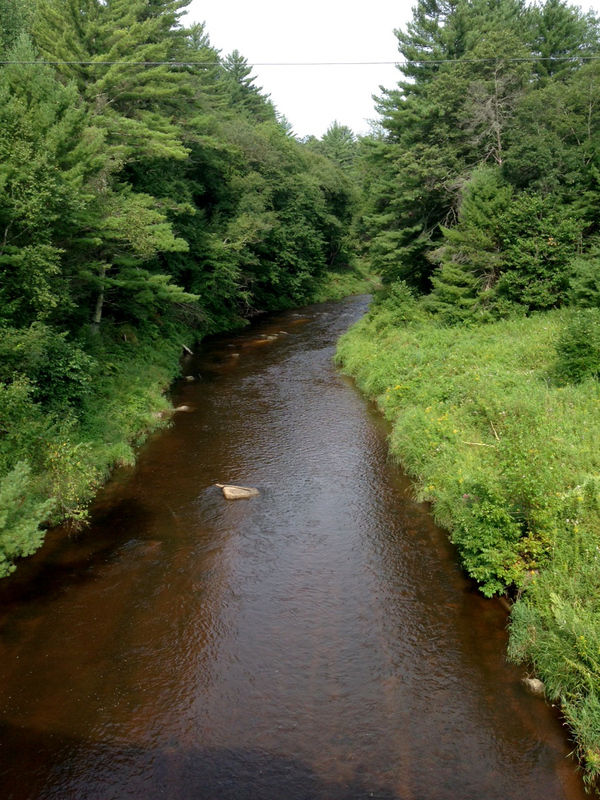 The Black River itself, was raging after a couple weeks of rain so paddling to the take-out situated right at the confluence took one of us (ahem, me) for a ride (had it not already been a perfect paddle, I might’ve continued downstream to who knows where?). The take-out is a legit landing on the Black River, officially named Hall’s Creek. There are no facilities but plenty of parking. 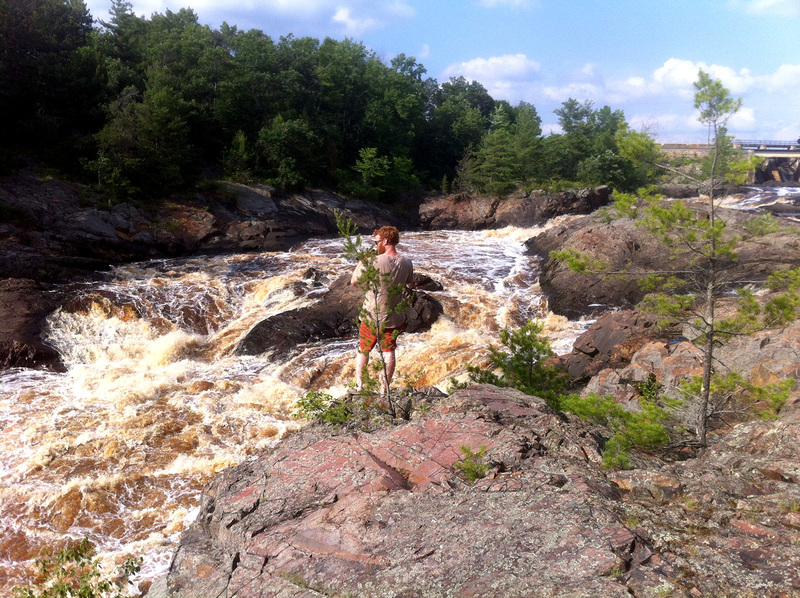 Unrelated to the paddle and on our way to the campground, we detoured to the Black near the dam to scout the rapids. There, we met some folks from Milwaukee, one a serious whitewater kayaker who was scouting the rapids for a potential run. 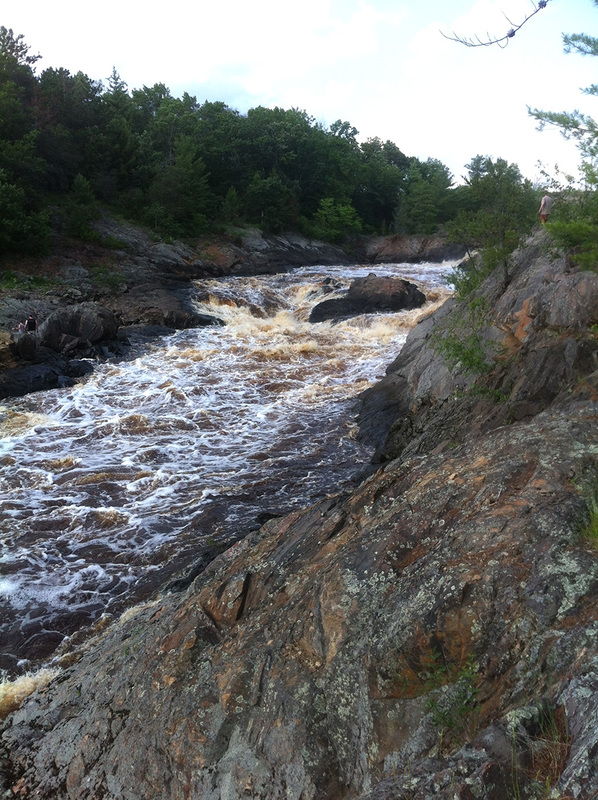 We hiked for about an hour, in awe of the massive amount of water churning downstream. He pointed out the lines (or lacktherof) he was looking for and explained the classes at each section, including a class V+ that had his gears turning. We watched as this guy struggled with an internal argument over the reality of successfully running it. Who knows if he did (he had planned for the Monday after that). Check out some of the scouting pics here, here, here and here. We spent the night at campsite #9 at the Black River East Fork Campground, one of my favorite places to tent when you’re riverside. For me, there’s nothing better than fishing from your campsite (sorry to the walleye I accidentally murdered). A storm rolled in that night, which led to some creative emergency shelter building/scrambling but that just made the day even more memorable. More importantly, it was keeping the water levels up in the area (and for the next day’s paddle too). Lastly, of all the things “We Liked,” I’d be remiss if I didn’t mention that it was on that night, I had my first ever homemade She-Meh-Neh burrito over an open-fire (Burrito Drive fans will understand the impressive nature of this feat). I didn’t even know it could be done but Timothy outdid himself and solidified his status as camp chef from here on out (kidding, I’ll help, if I have to). This is the least I’ve ever written about “didn’t like”. There really isn’t much to say. We saw very little wildlife but I’m stretching here – there’s just too damn much to look at and love otherwise. I’d go again in a heartbeat. The weather was perfect, the water was perfect and it doesn’t get much better than this for creek connoisseurs and lovers alike. It’s worth calling in sick to work if the water is up. Visual Gauge off County Road E.
The put-in below Trow Lake Dam. The one portage that in hindsight, didn’t need to be portaged. Looking upstream at the dam. The chute/plank/concrete path is in view on the right (or when paddling downstream, river-left). The best drop on the trip. We reco the pool on river-left. Upstream of the last drop, a relatively easy sloped descent on river-right. The beauty of this creek doesn’t end until the end. One last waterfall as you make your exit. Confluence with the Black River. The take-out at Halls Creek Landing.